Music: Jewel, Pieces of You – One of my favorite albums ever. And there is no substitute for one of the first cold days of the year, a hot soup, and relaxing music that brings you back to home. I have mentioned that this was our first try at gardening, right? Although it turned out great, we definitely learned some lessons. One of them being, grow a variety of things. It feels like we just grew zucchini and peppers. And we love zucchini and peppers, but variety will be the theme of our garden next year. We planted a late crop of lettuce – arugula and a mixed greens…so good. We planted spinach, mixed greens, and swiss chard early, but no spinach or lettuce came up and our chard was overrun with leaf miners…nasty little buggers. We got to enjoy one batch or wonderful lettuce before out landlord SPRAYED OUR GARDEN WITH WHITE SPRAY PAINT. Oh, the joys of renting. Back to the soup! I can’t believe it is fall in Denver already!! Fresh snow on mountain tops and boxes of summer clothes to the basement. So, a hearty soup is in order, naturally. 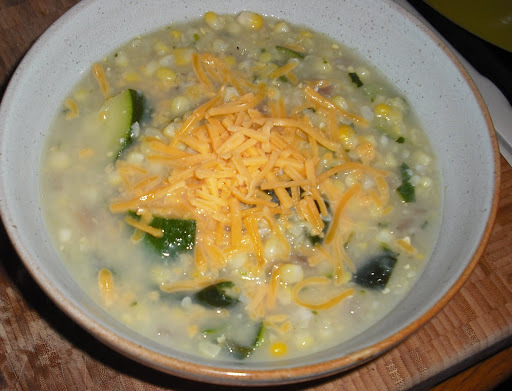 Since I have massive amounts of zucchini and peppers, I thought this poblano and zucchini soup would be perfect. Sweet, but spicy and full of big chucks of veggies…can’t go wrong with that. Top it with cheese and maybe a little lime sour cream. Yummmmmm. Oh! And for those of you super observant people, you might have noticed the background of the pictures changing…you’re right! We moved!!! And you know what that means?!? Housewarming party coming up 🙂 I plan to feature all the recipes, time planning tips, and hosting ideas right here. So stay tuned that party is coming. Heat 1 – 2 TB EVOO in large pot over medium-high heat. 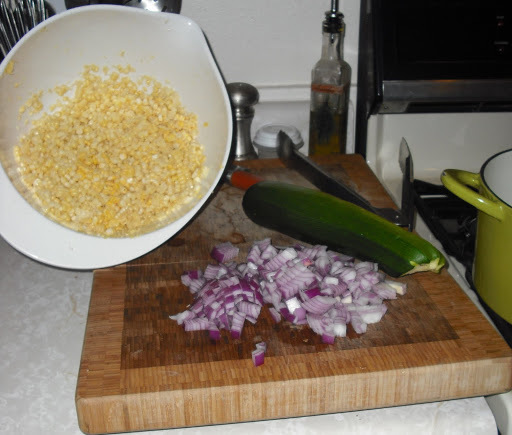 Add onion and saute until translucent. Add poblanos and jalapenos and cook for 2 -3 minutes. Season with S & P and cumin. Add garlic and saute until fragrant, about 30 seconds. 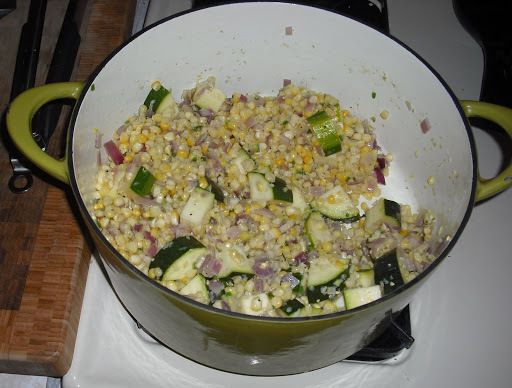 Add zucchini and corn and stir to combine. Cover ingredients with chicken stock and water. increase heat to high and let it come to a boil. Turn heat down and let soup simmer gently for about 7 – 10 minutes. 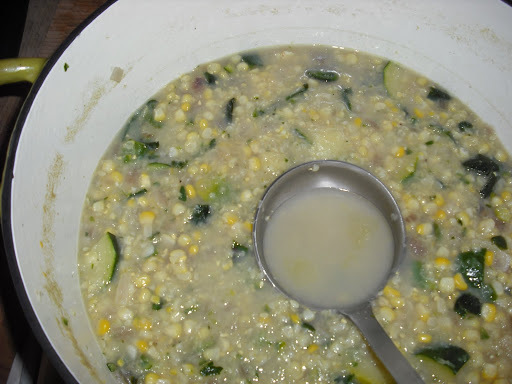 With a hand immersion blender, blend soup slightly to thicken and provide some texture. We like our soup thick and chunky, but you can blend it all the way down, if you prefer it that way. *We use “Better than Bouillon” chicken base. This entry was posted in soup, Vegetarian by callywoodfarms. Bookmark the permalink.